The MSAT Splitter Series was specifically designed to work in conjunction with DIRECTV's single wire multiswitch technology (SWiM) within Commercial MDU applications. 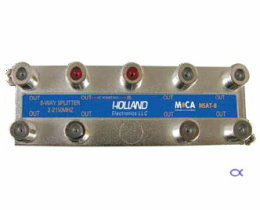 Holland Electronics worked closely with DIRECTV's and the MoCA Alliance to develop a splitter with on-board MoCA capabilities. Used after a standard SWiM module, or after DIRECTV's, new SWiM-integrated dish, the MSAT Splitter Series allows you to split the outputs from these devices to provide signal to up to 8 satellite receivers. With sealed F-ports, performance-tested plating and rugged cases, the MSAT Splitter Series can be used indoors as well as in harsh outdoor environments.